I’m broadly interested in understanding population structure and using genetics to further conservation efforts. 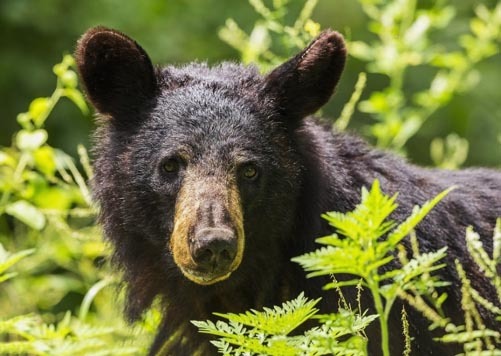 Genetic sequencing is an efficient tool for estimating population size and health of black bears while remaining non-invasive which is essential to my goals as a conservationist. I’m also interested in how anthropogenic forces, such as fragmentation, habitat loss, and conservation management plans affect populations and the landscape for various species including black bears, mule deer, mountain lions, hummingbirds, pronghorn and bighorn sheep. Continuing on the foundation of black bear genetics started at Dr. Ernest’s previous lab at UC Davis, we will further analyze hair samples collected from coastal and Sierra Nevada ecoregions in California. We aim to effectively estimate bear population numbers, and assess landscape genetics in California, using hair samples collected from noninvasive and harmless hair snares. Molecular mark-recapture will allow us to identify movement of individual black bears and compare current estimates of population size to previous work completed by Jamie Sherman (PhD student in Dr. Ernest’s lab) and the California Department of Wildlife (CDFW). Sampling wood frogs and recording site-specific characteristics in Willow Park, Wyoming (July 2016). Several amphibian species in southern Wyoming and northern Colorado are listed as vulnerable or endangered. I completed visual encounter surveys for northern leopard frogs, boreal chorus frogs, wood frogs, western toads and barred salamander in high elevation (>9000 ft.) wetlands in Medicine Bow and Routt National Forests. 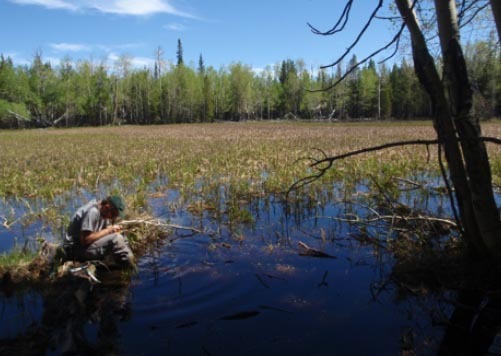 Environmental DNA was collected to further predict if elusive or endangered species were present in each wetland, but not visually detectable. This project also aimed to approximate the presence of the chytrid fungus, a serious and fatal disease affecting amphibians in North America as well as globally. 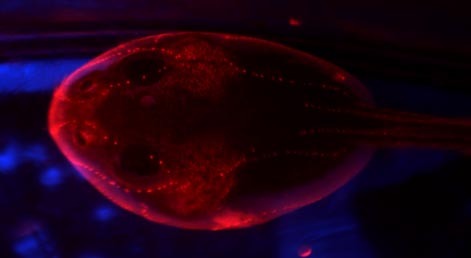 Southern leopard frog tadpole under fluorescence microscopy, displaying healthy lateral lines around the eyes and dorsally. Sub-lethal copper exposure affects the lateral line system in two species of tadpoles; southern leopard frogs and Great Plains toads. Heavy metals in the environment have increased due to natural and anthropogenic sources, and can alter behavior, result in teratogenesis, decrease reproduction and hinder survival in amphibians. Lateral lines are vital to sensing water movement and direction, and damage to this organ system can impair predator detection, and proper orientation towards a current. Other projects of my MSc degree included morphometric analysis of Plains spadefoot tadpoles in the presence of various predator cues, studying kin recognition behavior in Great Plains toad tadpoles, and development of a food-based assay for Physa snails. I’m originally from St. Louis, Missouri, where I took advantage of the great resources the Midwest afforded, including oak forest state parks, wild elk and bison refuges, and weekend floating trips on many of Eastern Missouri’s winding rivers. I moved to northern Missouri for my undergrad, where I became involved in Alpha Sigma Gamma’s service sorority and TSODA Dance Company to practice ballet. During this time, I worked with the Saint Louis Zoo’s Endocrinology lab studying Asian elephants and Fennec foxes. 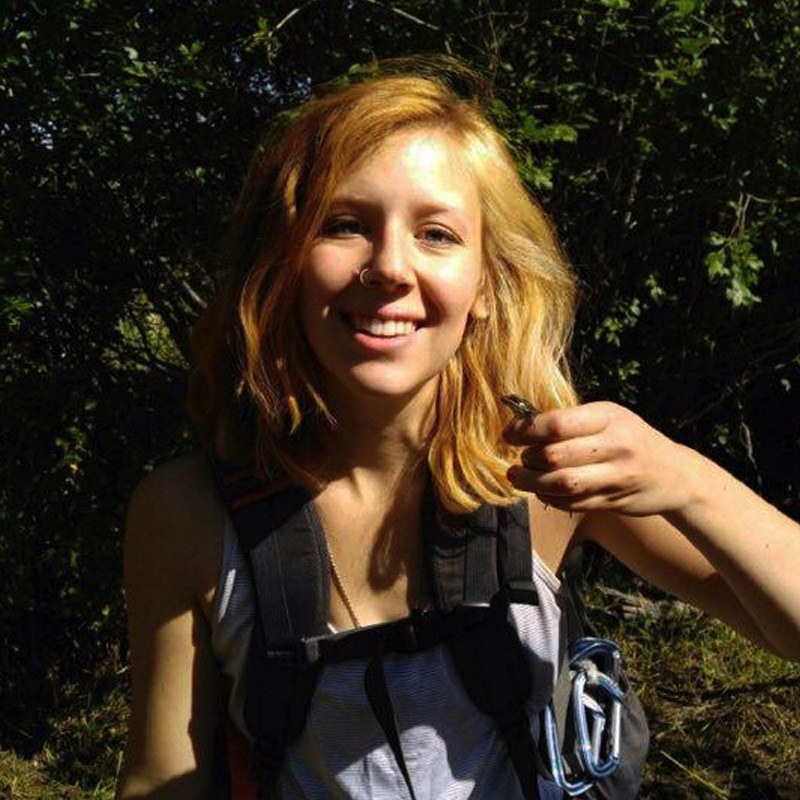 After moving to Oklahoma State, I fell in love with amphibians and spent long nights wading through wetlands and ponds for my research. I still enjoy herping and exploring Wyoming’s mountains and Medicine Bow forest. When not working in the lab, I’ll be rock climbing in Vedauwoo or traveling to climbing crags. I live for coffee, am an avid reader, and love enjoying the outdoors with my two cats and beagles.